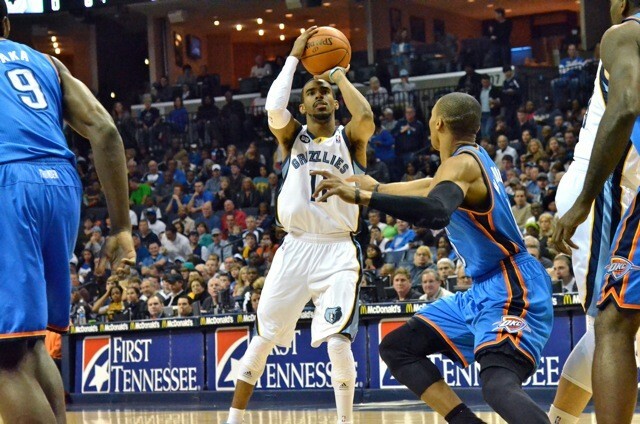 Mike Conley may be the most important player in this series for the Grizzlies. I've been half-jokingly touting the Conley Correlation all season — predicting it before the season, really — and it's mostly held up in the playoffs. In Game 1 against the Clippers, Conley looked overmatched, particularly in the first half, and the Grizzlies were blown out. After that, Conley settled down and played Chris Paul, if not quite even, at least closer than most would have expected, putting up a massive 28-9 in a Game 2 that was only lost on a last-second shot by Paul. In the four wins, Conley notched 36 assists to only five turnovers, scoring 15 or more points in three of the four wins. He did shoot a dreadful 1-9 in a Game 3 win, but offset that with a superb 10/0 assist/turnover performance. Against the Thunder, Conley had his worst all-around game of the playoffs so far, shooting 5-15 with only three assists and a couple of killer turnovers in the final minute. If the Grizzlies are going to have a chance to win this series, that can't stand. Facing the athletic but inexperienced Reggie Jackson or the 38-year-old Derek Fisher in most instances, Conley needs to assert himself. He's the best all-around guard in this series now, and the Grizzlies probably won't win unless he plays like it. On the other side of the floor, the Grizzlies have to fix their defense against Martin. After shooting 1-10 in Oklahoma City's Game 5 home loss to Houston, Martin has scored 50 points on 15-27 shooting in the Thunder's past two games, the Game 6 road closeout against Houston and then Sunday's Game 1 against Memphis. Containing Kevin Durant requires as much luck as good defense, but if the Grizzlies can put the squeeze on Martin, that will make it difficult on a Thunder team that relies heavily on Durant and Martin for offense. And, for the Grizzlies, the Martin question is partly a Tony Allen question. Martin can be a difficult match-up for Allen. Martin's herky-jerky style with the ball can bait the hyper-aggressive Allen into fouls. Off the ball, Martin's movement and quick release can sometimes help him take advantage of Allen's penchant to gamble and try to make plays off of his man. The latter was a big problem in Game 1 and a likely rationale for Allen's limited minutes. But Allen was a Top 5 finisher in the Defensive Player of the Year vote and is a near-certainty to make his third straight All-Defensive team. When you're giving up 60 of 93 points to two wing players and you employ one of the best 3-5 (to be conservative) wing defenders in the league, he's got to be in the game. And, honestly, despite Lionel Hollins' protestations, I'm not sure I wouldn't have him on Durant more. Allen gives up a lot of size there and Durant can go large on anybody, but Allen's done a credible job on him in the past. Would it really get worse than 35-15-6 on 50% shooting? This is all dependent, of course, on Allen playing better — forcing his way into more minutes, essentially. That's what happened in the Clippers series. Allen played only 19 minutes in Game 1, but played great out of the gate in Game 2 and didn't player fewer than 27 minutes the rest of the series. In addition to Allen settling down and getting back on his game, the Grizzlies have to be more disciplined in general on Martin (and, to a lesser degree, Derek Fisher), which means staying at home and denying them easy, open catch-and-shoot looks that collapsing on Durant can create. There's going to be a lot more to this series than the production of Conley and Martin, but if they go in opposite extremes — as in Game 1, to the Thunder's benefit — I think that would be decisive. Tuesday night, in Game 2, we'll begin to see if Conley can bounce back and the Grizzlies can make the right adjustments on Martin.